If you want to use a zipper with a faux or real fur fabric it can be difficult to open and close the zipper because of the hairy fabric. You can prevent this by covering the zipper teeth with a piece of tape. For the example I used a piece of satin bias tape, which was pre folded but I pressed it open and folded it again in half and sewed the covering tape with a loose tension so I can remove that stitching after I have sewed the zipper in the garment. I used a different colour because it is easier to see which tread has to be removed later. This is not necessary, if you do not want to remove the first stitching use a matching colour thread and a normal tension. You can use any other piece of tape or a strip of folded lining fabric. 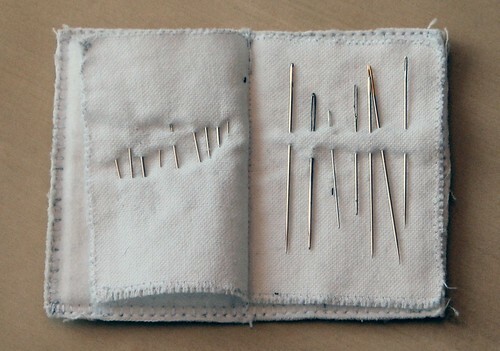 My mother sent me these vintage needle booklets for Christmas – aren’t they wonderful? She said in her note that she found them at a “second hand sale” and as soon as I opened them I felt an immediate and powerful connection to the sewist who used them. My favorite tools are always the ones I make myself. I made the needle book below a few years ago when I was going through a bit of OCD while trying to embroider a proper bullion rose. 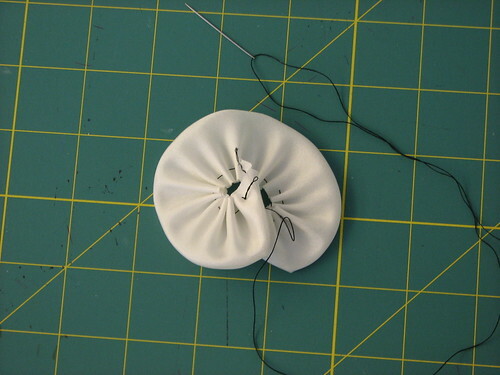 The “cover” is filled with two pieces of plastic canvas zigzagged round the edges, then trimmed. I added flannel pages and stitched a center “binding” between the pieces of plastic canvas. I have a collection of vintage needles I that like to use for embroidery and hand sewing, so I store them in this booklet. I have this fantasy that the woman who made the vintage needle books was just as pleased as I was when she finished hers. The fronts and back are two colors of wool felt, and the pages are white flannel. 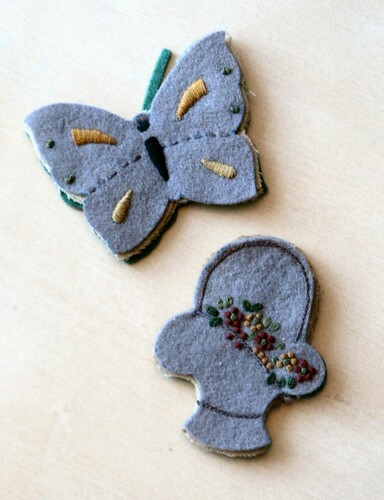 The butterfly is missing one antenna, but the simple silk floss embellishment is still bright. The flower basket is embellished with posies stitched from french knots and lazy daisy stitches for leaves. The handle of the basket folds down to show the needles. Based on the shapes and colors I’d say both date from the late 1930’s to mid 1940’s. I love the imagery from this era because it reminds me of my grandmother and my great aunts. I doubt I’ll take the needles out – I’d rather leave them just as they are, as they were, the last time the unkown maker touched them. A sewing moment frozen in time; a tangible link to the past and a respite from modern life. I found some more pictures I took from the blouse flower “buttons”. The underside (bottom) is shaped into a small square about 1/2 inch wide. The bottom is attached to the blouse center front at two spots, this way the loops stay put on them. It makes sense that the loops although they are tiny are edge-stitched too so they will keep their shape by the weight of the flowers. Els post on the Dior Rose reminded me of how much I love this as an embellishment. 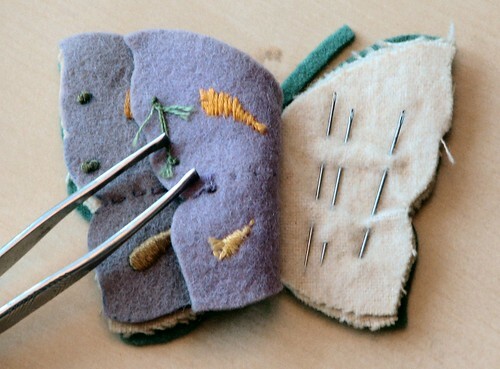 Purchased trims are often more expensive than your fabric, and these can be made from scraps. These are easy to do and they can be made in just about any size. Draw a long rectangle on paper. 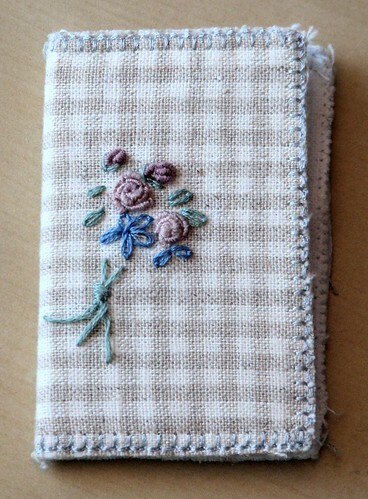 This one is 2 inches wide by 10 inches long; a longer rectangle will make a rose with more “petals”. 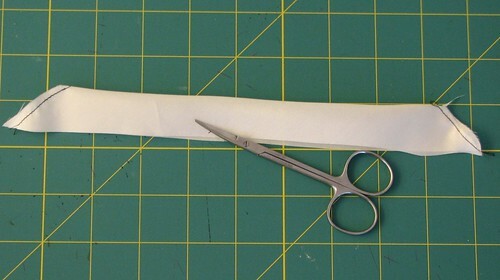 Fold the rectangle in half and mark off a curved edge using a French Curve. 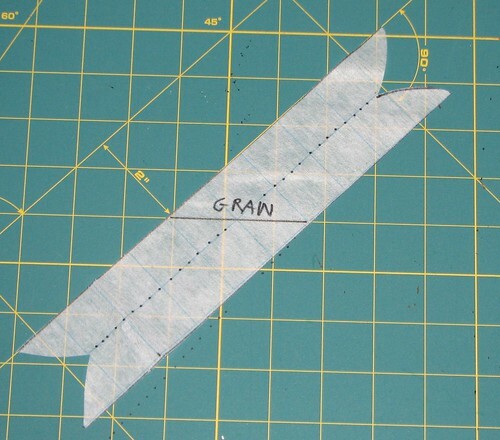 Mark a 45 degree angle as the grain line because you will cut this out on the bias. 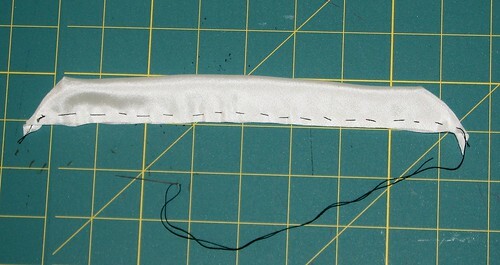 Take a length of knotted thread and baste along the bottom cut edge. Don’t cut the thread after basting ; just leave it in the needle. Gently pull the basting to form a circle and then begin to roll the rose into shape from the inside to the outside, gently incorporating the gathers into a shape that pleases you. Use the still-threaded needle to hand sew the rose together once you have it gathered into a shape that resembles the ones from Els’ post. The trick in making these is to keep the shape flat like a button as opposed to a twisted cone shape. If this is a challenge you can stitch the flower onto a backing such as ultra-suede, felt or buckram. It’s also good to make a one or two extra so you can choose the best-looking ones for your project. One word of caution – if these roses are crushed or ironed they lose all of their appeal, so it’s never a bad idea to remove them from a garment before you clean it. 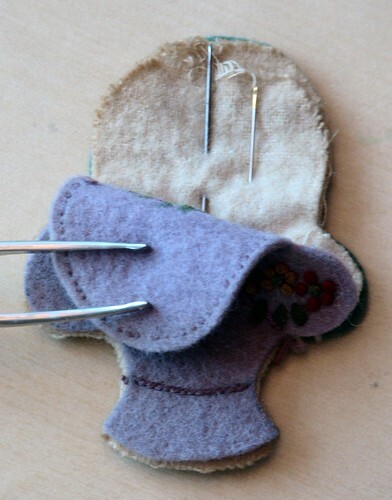 You could sew snaps onto them to make them easily removable, and if you’ve use a backing snaps are simple to add. So that’s it! 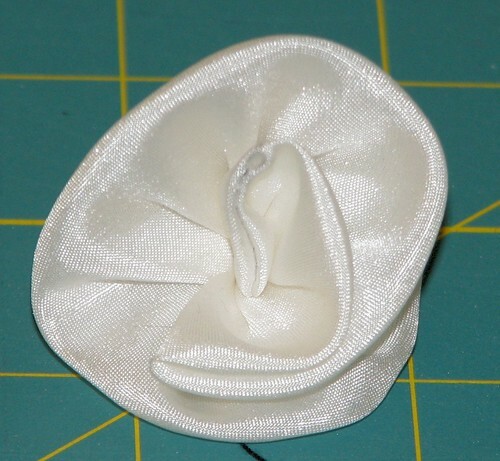 This is a classic embellishment you can use on gowns, dresses, bags, hats or even as a brooch.